OK, so cats don’t really have 9 lives. That rumour was probably due in part to their incredible powers of survival, including the ability to always land on their feet. But the question of how they do that still puzzled physicists for a very long time. Turning in mid-air seems to violate the conservation of angular momentum, in which an object can neither start nor stop rotating without a force being applied. The puzzle could only be solved with the invention of high-speed photography, in the late 19th century. The photos revealed that the cats turn over by twisting around the middle and rotating the front and back halves separately. By controlling the amount each part turns, they’re able achieve a net rotation while still keeping their total angular momentum constant. This trick was described in great detail by Dr Donald McDonald in his 1960 paper “How does a cat fall on its feet?”, The New Scientist, vol. 7, no. 189, pp. 1647-9. So, knowing how cats do the flip, an obvious question is: can humans do it? Well, sort of. In a follow up paper in 1961, “How does a man twist in the air?”, The New Scientist, vol. 10, no. 237, p. 501-3, Dr McDonald showed that it is possible for a human to turn themselves around in the same way a cat does. But the problem is that, being creatures that walk on two legs, it would be more useful for us to flip end-over-end, which unfortunately isn’t possible. Generally though, it seems to work for cats, but within certain limits. The strategy of landing on your feet is great if you fall out of a tree, but it’s less successful if you drop from a tall building; a condition known as “High-rise syndrome”, for obvious reasons. Curiously, the rate of injuries for cats falling from buildings seems to decrease above a height of 7 stories. This was first identified in 1987 (Whitney WO & Metcalf CJ 1987, “High-rise syndrome in cats”, Journal of the American Veterinary Association, vol. 191, no. 11, pp. 1399-403), but has been confirmed in other studies since. On the other hand, a cat permanently in free-fall – like in space – keeps turning over and over repeatedly. 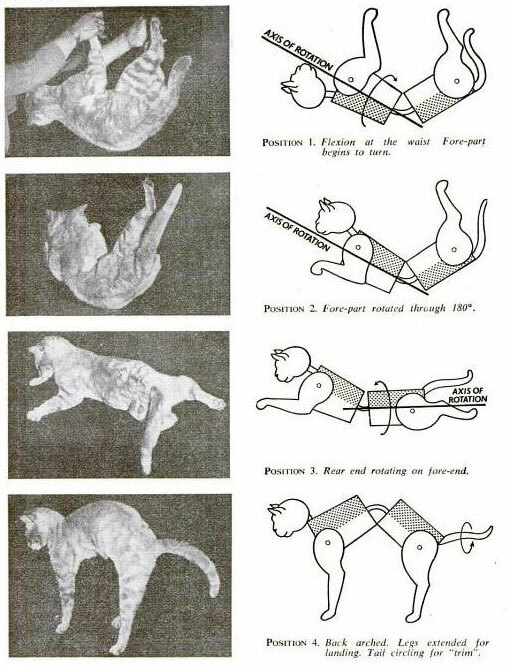 This experiment of cats in zero gravity was actually performed by some brave feline astronauts in the early days of spaceflight: see this video of weightless cats (do not try this at home). Finally, as another example of amazing things cats do that are probably more complicated then they need to be, there is a recent study on how they lap water: Reis PM, Jung S, Aristoff JM & Stocker R 2010, “How cats lap: water uptake by Felis catus“, Science, vol. 330, no. 6008, pp. 1231-4. My cat has been known to actually trip over his own feet. He also has an enormous radius. Great first show – look forward to the next one.